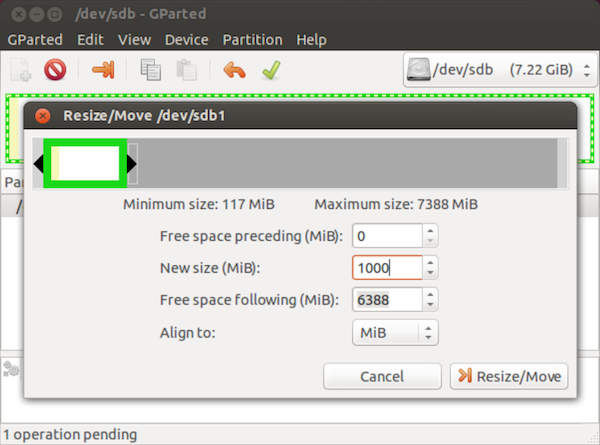 For this step you need Ubuntu (or any other operating system that can run Gparted). Applications like Disk Utility (the OSX partition manager) doesn’t seem to be able to resize partitions and/or create ext4 file systems. And you can’t use the bootable Ubuntu drive we just created, because we have to unmount the boot partition to resize it – which is not possible. Why 1GB although currently only 750MB is used? I do not recommend this; but when you upgrade to another Ubuntu version (e.g. from 12.04 to 12.10) or update the kernel, the upgrade-application writes files to the boot partition. For this reason I like it to be at least 1GB – just to be sure. Probably there’s a masochistic way to do all of this with the terminal. But if you like doing things the hard way, I will make this even more pleasant for you by not helping you in any way possible. This part you can do when booted from your new external Ubuntu drive! 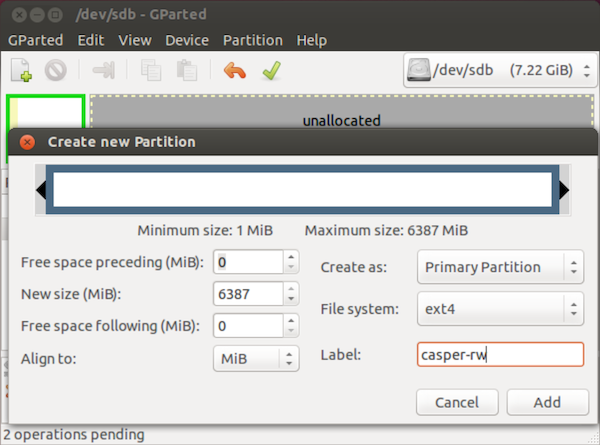 So we need to add an casper-rw partition..
Read the “Optimize“-section to learn how to boot directly to Ubuntu (skipping all the menu’s). Also read that page for the changes you need to make in case you want to update the kernel or upgrade to a new Ubuntu version (e.g. from 12.04 to 12.10). Awesome guide, thank you! Although, I think that’s why people still use Windows, they don’t need a guide to show them how to edit core files from a boot menu. @Thiago, you do realise this is for a bootable USB stick, I hope? Installing Ubuntu on a fixed hdd doesn’t require editing any editing of core files. Hi, I am new in the Linux world, I just discover this post and I see is too old, you are using Ubuntu 12.10. Could you do it please with Ubuntu 17.04? I follow this tutorial but Ubuntu do not Start. After showing grub fill my screen with letters and then say error a lot of times and finally get freeze. He editado el 3 archivo, los 3 tal y como hay que editarlos. and leaves me with BusyBox prompt. Strangely, if I now cd to /cow, I can see there are four items (upper dir, work dir and format file), so the casper-rw partition in fact was mounted successfully. Totally stuck at this point, no idea what and how to fix. Hi, I tried “Make it persistent” with your method on my Mac. It worked. Thanks.